People with speech disabilities in Ontario can now receive a 75 percent discount on the purchase of an iPad or iPod Touch preloaded with MyVoice's TalkRocket Go -English or French version- communication aid app. 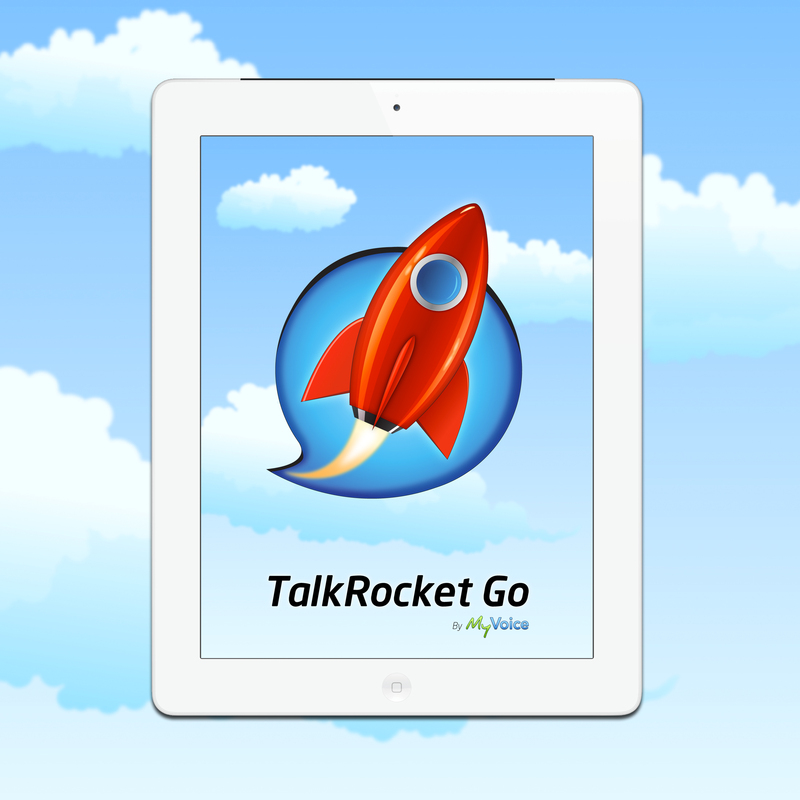 'TalkRocket Go is an exceptional app that has powerful features for users and speech-language pathologists alike. The app offers tremendous value especially now that it is publicly funded in Ontario,' said Speech Language Pathologist Jeffrey C. Lear. MyVoice Inc. is pleased to announce that people in Ontario with speech disabilities can now receive the company's TalkRocket Go communication aid app, in English or French, along with an iPad or iPod Touch at just one-quarter of the cost, thanks to the Ontario Ministry of Health's Assistive Devices Program. "As a parent of a teen with disabilities, I know how quickly the costs add up," said Tony Gross, MyVoice's Community Director. "This new funding means that Ontarians with a speech disability now have access to a more affordable and accessible communication aid: TalkRocket Go." “TalkRocket Go is an exceptional app that has powerful features for users and speech-language pathologists alike. The app offers tremendous value especially now that it is publicly funded in Ontario,” said Speech and Language Pathologist Jeffrey C. Lear, M.Sc., CCC-SLP, Reg. CASLPO. To access the benefits of the new funding, families should begin by seeking an assessment at one of 26 qualified Assistive Devices Program clinics throughout Ontario. For a detailed list of clinics click here: http://www.accpc.ca/pdfs/Ontario%20AAC%20Clinics%20-%20Nov2012.pdf. If TalkRocket Go for iPad or iPod Touch is recommended as the right communication aid for you or a family member, a clinical professional can help complete the paperwork to obtain the device and app at a 75 per cent discount. "I have seen first-hand how our TalkRocket Go app has changed the lives of so many kids and adults," concluded Tony Gross. "Now, we're going to change thousands more." This announcement also marks a new milestone for support of Made-in-Canada products, as TalkRocket Go becomes the first Canadian communication aid app to receive Ontario public funding. TalkRocket Go is built on technology first developed at the University of Toronto and is supported by a passionate team headquartered in Toronto's historic Queen West neighborhood. TalkRocket Go is an app for iPad, iPod Touch, and iPhone that helps users communicate verbally. The app has helped thousands of people worldwide with diverse disabilities including Autism, Cerebral Palsy, Aphasia, and Parkinson's disease. It has been used by children as young as 16 months, and adults as old as 97 years. Easy to use, easy to support interface. Personal customization of vocabulary and images. Free online editing tools for clinicians and caregivers. Expressive voices for English and French. Location-based vocabularies for faster communication. Physical accessibility options including scanning, switches, and more. TalkRocket Go is regularly priced at $99.99 in the iTunes Store, and equivalent prices worldwide. MyVoice Inc. is a Toronto-based company that makes innovative technologies for people with speech disabilities. MyVoice is a leader in the ongoing movement to use new devices like the iPad to empower people with disabilities. Before MyVoice and its peers, communication aids were difficult to operate, and would cost up to $20,000, putting them out of reach for most people in need. MyVoice’s communication aid apps - TalkRocket Go and the newly launched RocketKeys - are pioneering amazing new features, while also being among the most affordable products of their kind. MyVoice’s apps have won the Autism App of Distinction award, were featured by Apple as a recommended Special Education app, and have been named the #1 Medical App in the United States, and Canada. MyVoice’s creators were named the University of Toronto’s Inventors of the Year and PROFIT Magazine’s Entrepreneur of the Year. MyVoice has been featured on Discovery Channel, Engadget, Fast Company, and more than 100 other print and web publications. TalkRocket Go's launch screen on iPad.